Halloween is approaching and shelves in the shops are already overloaded with scary costumes, bats, rats, masks and other trashy creepy items. 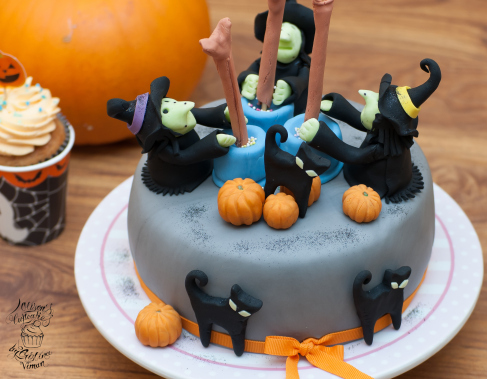 Most of us have attempted (and often succeed) to bake and wonderfully decorate Halloween-themed cakes, with smiling ghosts, fluffy owls, cute rats and adorably ugly witches, that overall though inspire a smile and not genuine revulsion. Also in Italy, where instead of Halloween we celebrate our beloved departed and all Saints on the next day (it’s not a coincidence that Halloween derives from All-Hallows’Eve) we bake cakes and cookies that are in some ways related to death (e.g. fave dei morti – literally “broadbeans of the deads”), that look absolutely yummy and not scary at all. But what’s Halloween without some genuine terror? 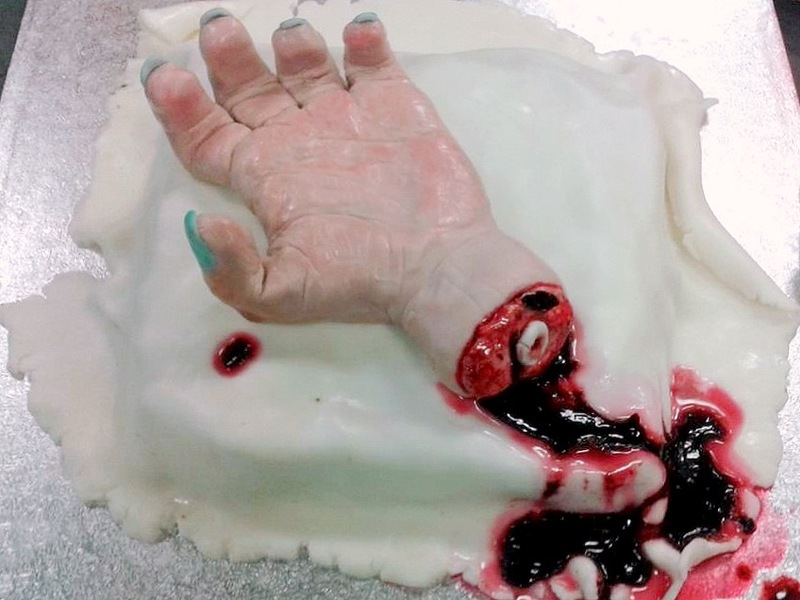 For this reason, I have decided I am going to bake and post, from now until Halloween, some Halloween-themed cakes, that I hope can both inspire you and (only visually!) give you an unpleasant sense of nausea. Still…they will be delicious at the palate! (as least I hope… hehe…). Let’s start then with the first cake, that I actually baked one year ago. For the base I baked a chocolate sponge, cut it in half and filled and topped with strawberry icing. You can use any cake you want as a base, as a white sheet of icing will cover it. 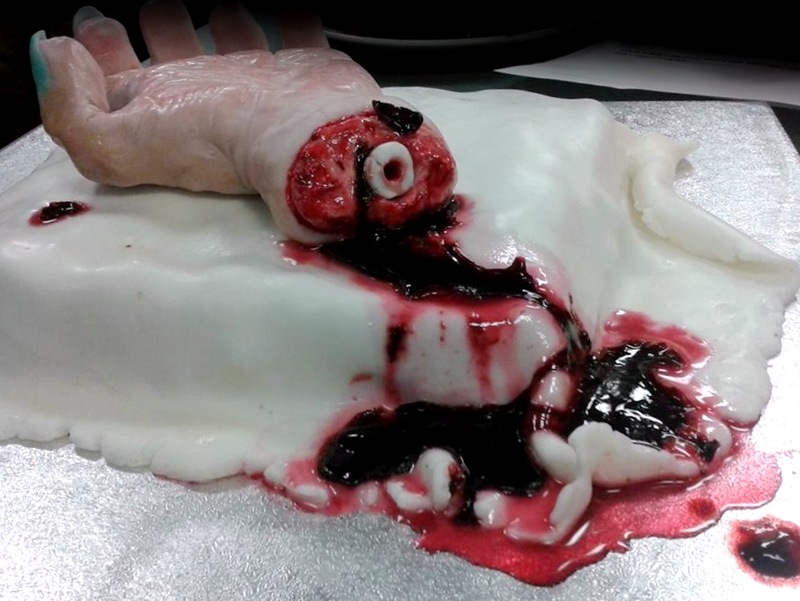 The main part of this cake is, in fact, not the sponge itself, but the decoration on top of it: a chopped hand. All you need for the whole decoration is 1.5 or 2kg of “ready to roll” white icing and edible colors. For the clotted blood I used gelatin sheets, red edible color and raspberries. (If you prefer, you can directly buy the colored icing; I made some skin-color icing myself mixing a few drops of red and a tiny little bit of black and blue to a white block of icing. I mixed the colors using my hands, as if I was working plasticine. You can add more red or black or other colors until you reach the desired shade of skin color). You should first start with building the rough shape of the hand, using skin-color icing. To do this, you should prepare: A) five cylinders for the fingers (one of them larger but shorter for the thumb, another one thinner and shorter for the little finger); B) a larger squared block for the palm of the hand; C) a smaller large cylinder for the wrist. You can now assemble these pieces together, obtaining a very rudimentary shape of a hand. Now use your fingers to smooth the edges and make the hand look more realistic. When/if you fold the fingers, don’t do it as if each cylinder/finger could bend smoothly. Remember that each finger is composed by three segments (phalanxes); so if you want to bend a finger, bend it at 1/3 or 2/3 of the total length: this will contribute to obtain a more realistic result. At this point I used my own hand as model to get inspiration for the lines, folds and little details of the palm of the hand, in order to make it more realistic. To add these details, I used small tools to shaping and smoothing clay I had at home. If you don’t have them, you can use anything you would like to, as toothpicks for example… Just improvise with whatever you may have available in your house. Once the hand is done, it’s time to add the fingernails: mix a bit of blue or any other color you like to some white icing and mold five flat nails. You can attach the nails to the hand straight away. At this point, let’s prepare the red flesh and the bone for the wound. To make the cut more realistic, create a cavity where the hand has been cut. Stuff this cavity first with a handful of mixed pink and more reddish icings, previously coarsely mixed together (until they resemble a sausage-texture meat); this will give the effect of the fresh flesh. For the bone: create a white cylinder (1-1.5cm in diameter) and then dig a hole in the middle (using a bencil or anything else you have available), where the marrow should be. Now stick the bone in the middle of the “sausage-looking” icing. Your hand is done! You can now use a small paint brush to add color details straight on your sculpted hand. It will make details more shiny and even more realistic. Roll out a large white sheet of icing paste and place it on top of the cake you have previously prepared. A sheet with irregular edges will look more like a white cotton towel where the hand will be placed. Now place the painted hand on top of the cake covered with the white icing. For the clotted blood: Prepare some red gelatin using dry gelatin sheets and red edible color (I also added some blended raspberries to add taste, but removed first the little seeds with a small colander). Once the gelatin has started cooling down and becoming thicker, pour it next to the wound, where the exposed bone is, as if clotted blood is coming out from the wound. Let the gelatin cool down completely and the icing dry out a bit and… your cake is now ready to be served! I made up myself the procedure to decorate this cake, so you can just use the passages I described as a general guideline. Surely you can do a better job simply improvising while you are preparing it, adding more details, shaping the hand in a different way… just get inspired by your imagination and creativity. 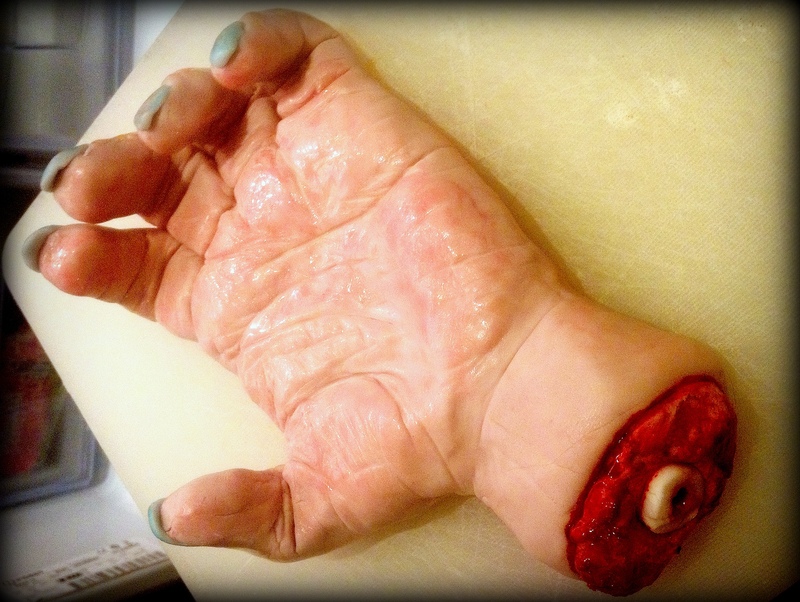 And have fun while molding the icing and painting your scary chopped hand! I am looking forward to seeing your results!